Design for public space in the public space: We want to create designs that have an impact in the public space. We want to democratize design so that is accessible to all. Because design is not a method to make things expensive, it is a method to improve the things that humans interact with, to improve the way we live. 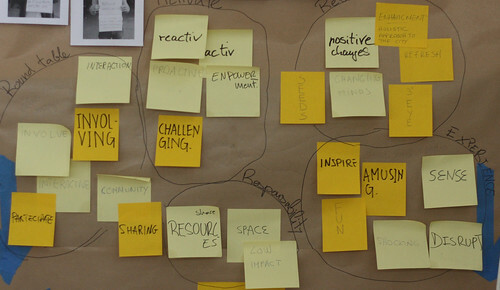 Engagement with locals: We want to design there where we are, with the people that will use it, and for the community. By decentralizing the process of designing and making we share the cost among all, in this way making the design accessible to all. Therefore we do not just look at the design of the -object- but we design the whole process and facilitate points of engagement for the general public. Why to engage the public: In the web we have seen how numerous projects are quickly growing with relatively low budgets but creating high impacts. This is because the public grasp the possibility for engagement, and the quick and successful development of the -products-. By opening the process to the public we are able to multiply the pool of knowledge, and by finding topics that are of common interest, we engage them in the development multiplying the speed at which the outcomes are produced. 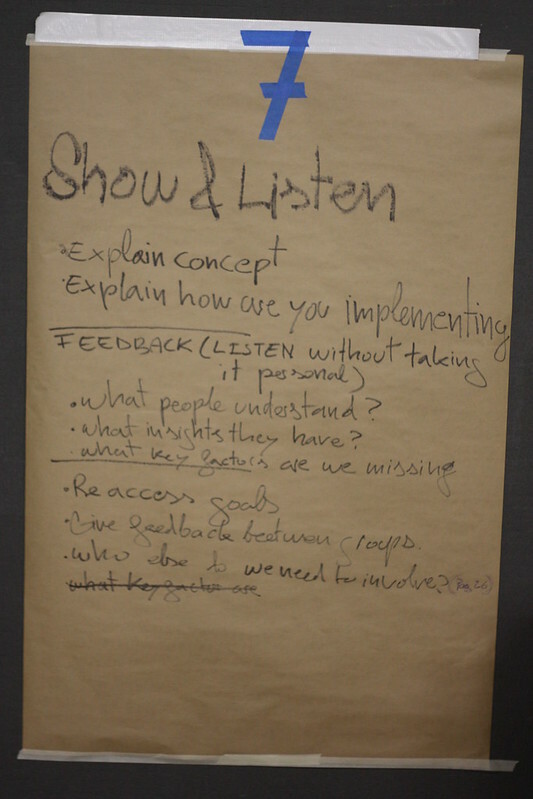 We also have to understand the many ways in which the public can get involved, which is not just as developer, but also giving feedback or even just getting inspired, and sparking another project. We learn this at this last MakerLab, where it was the first time where two of the projects developed by us, were presented at the public actions as experiences for passers by, and not as a workshop to take part in. Why to do it in the public space: We are inspired by what is happening in the web, but also know that this kind of collaborative approaches were happening before the web existed, they were just not so well spread. We believe that the public space is ultimately where people meet in the physical world. In this very space we can provoke the changes to the structures of our cities and the way we interact in it. Good examples are Urban gardens and FabLabs, so why not create laboratories where we can design and prototype solutions for social challenges? We believe the appropriation of the public space is not so much about occupying it, but about re-shaping it to cover our needs from today. Why use local resources: While importing skills, materials and cultures from other countries is a great inspiration, it also creates a dependency. We do not want to go to a new place to make the solutions for people that we do not know, in a place that we do not know with materials that they do not have. Rather we see that we can benefit others by sharing our skills, so that the locals can propose solutions for the challenges they face, with the resources they have available. In this way we spark solutions that will continue to evolve once we are gone. It has been a deep experience. Not only creative people, but beautiful people. If it wasn’t for you I wouldn’t ever walk the whole night throughout the city, never knew that having a twin sister would affect your blackberry internet connection, that Malta was actually a country and not only a sicilian beach. I wouldn’t ever talk about vitality of languages with no vowels, never knew that you can play a guitar with a dead finger and definitely I will never look at plastic chairs in the same way anymore! I wouldn’t ever knew that Saltapini sisters have taken their gorgeousness from the landscape they live in, that portuguese girls are so good in pretending to understand italian and korean girls not that precise as they look. I wouldn’t ever knew that yellow strings were that versatile, that you can built a magical atmosphere with mere wood and screwdrivers. And that giving dinner to 36 persons could be that satisfying. 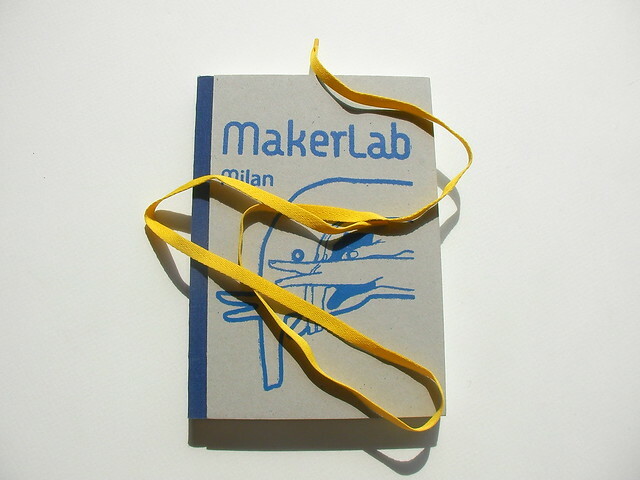 On the MakerLab Milan 2012 page we have written down the details about the process, the people that took part, our supporters and some of the projects that came out during the residency. We are apropriating the Via Cuccagna and customizing it. We want to do public design, in the public space, and we invite everybody interested to join us. 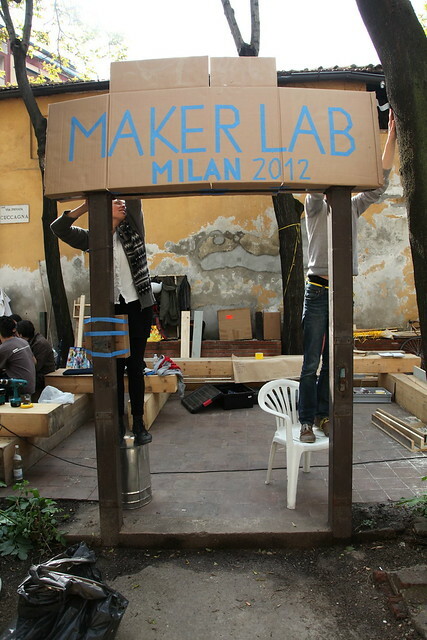 The MakerLab Milan has been happening since the 1st of April at the Superground (Artkichen). During the last weeks, we have been getting to know Milan and its inhabitants. Inspired by them, and together with some locals, we have develop two projects (read more here) which will be happening this week. 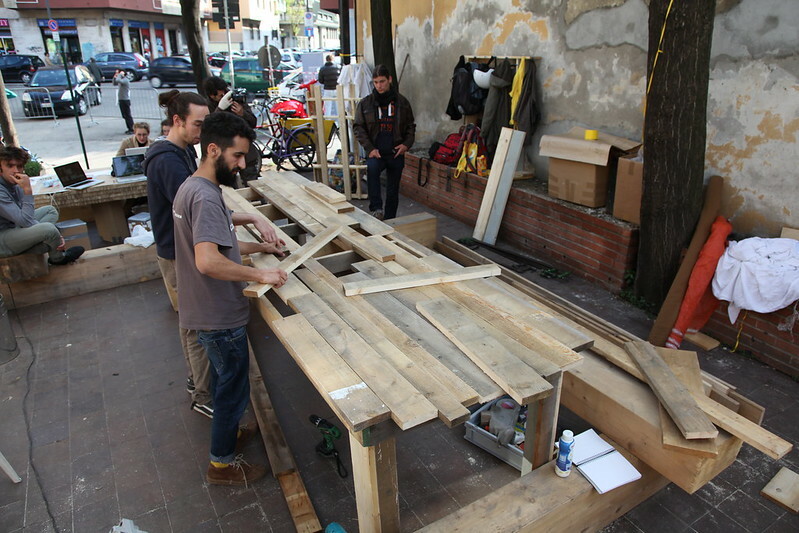 Parallel to that, we wanted to show our process live and open to the public during the Salone, for that we have set our self at the Via Cuccagna, just outside the Cascina Cuccagna, where we have build (and continue building) a space which covers our needs as creative activist. 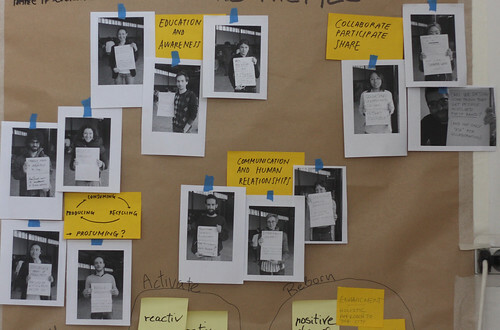 Create a temporary meet up place for creatives, researchers and activist, who want to share their knowledge. Built a workshop where the ideas transfered and discussed can become reallity. In the calendar we will be updating some of the activities that are taking place. We have hand tools and tables to work, a lot of people passing by, a lot of wood, cardboard and yellow strings, and even a cargo bike to pick up more stuff. 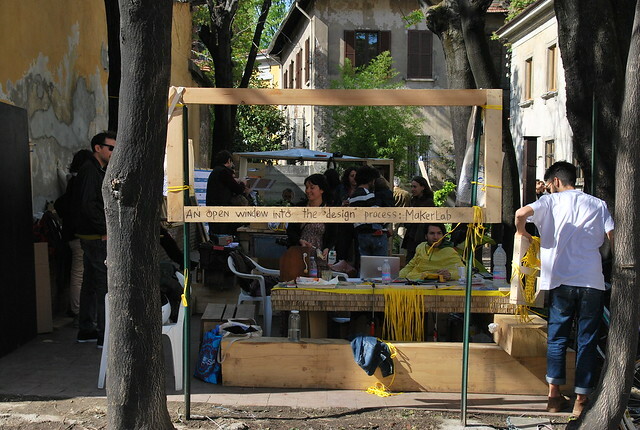 We want to invite makers from milan, to come and use the space, both as a way to promote its own work, to interact with the public, or just to get to know one another and transform the public space together. 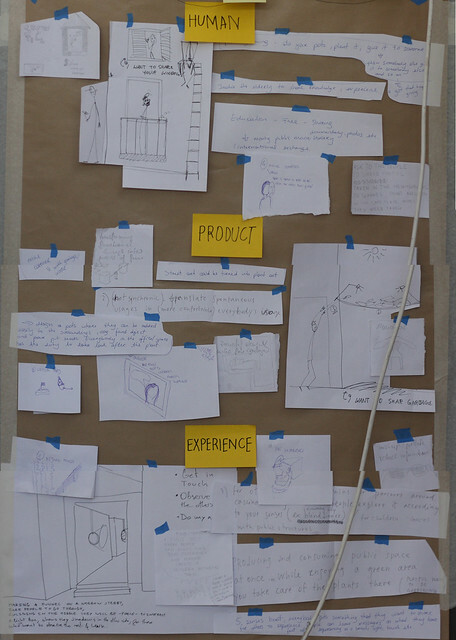 After the conept and our aim was clearified, each team studied the process more in detail. 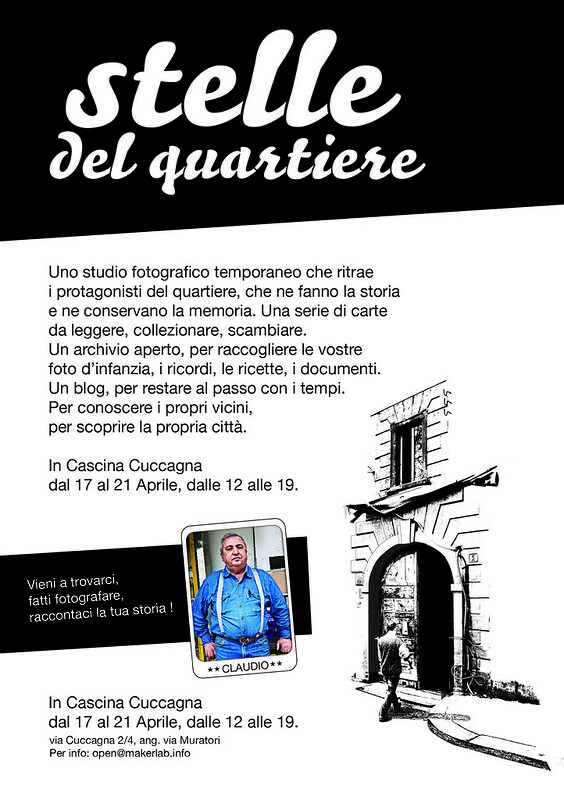 Stelle del quartier: First interviews in the quartier around Cascina Cuccagna. On day 7 we went to The Hub (Milan) where we could present the concepts that we were working with to a diverse group of freelanzers and enterpreneurs. 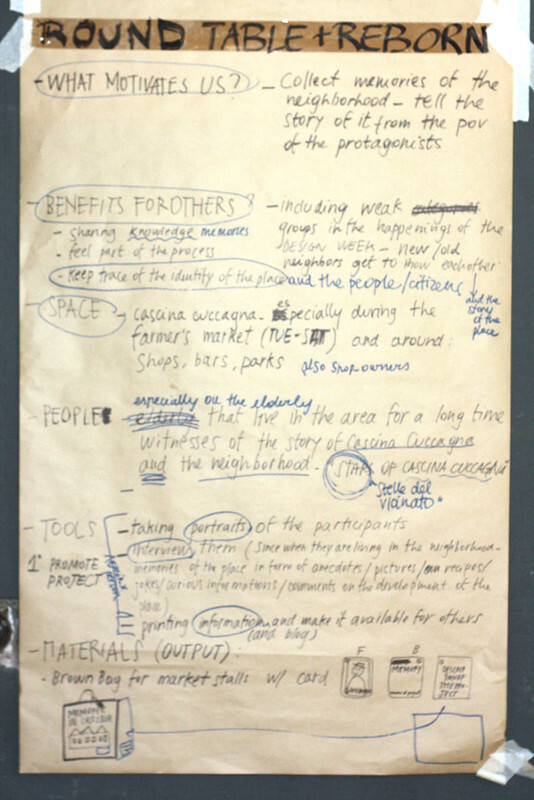 Stelle del quartiere is aimed at telling the story of Cascina Cuccagna and its surroundings collecting the memories of its main characters: people living and working there. With this project we hope to start an archive of information about the quarter, to introduce the inhabitants of the quarter to each other, to make them think of the developments of the neighbourhood. The collection of information will take place in three different ways. -a mobile unit that will meet people in the street, in parks, associations, shops in the surrounding of the Cascina starting from Friday, the 6th of April. The “Stars of the Neighbourhood” will be portrayed, interviewed, then represented on playing cards that people will read, collect and exchange. 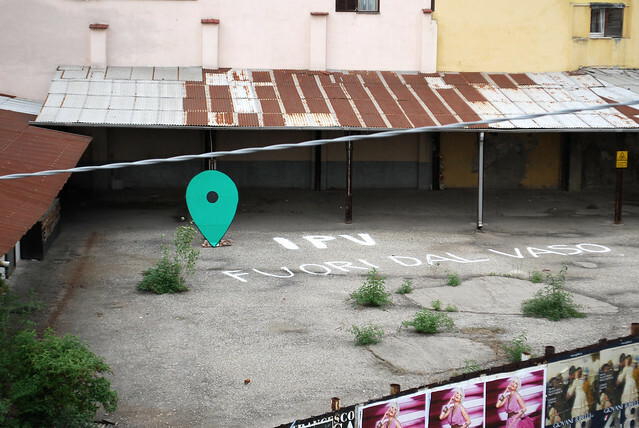 -a temporary photographic studio held at Cascina Cuccagna during the Public Design Festival. During the Festival we would like to involve also some engaged neighbors to talk with guests about their experiences (i.e. living libraries). 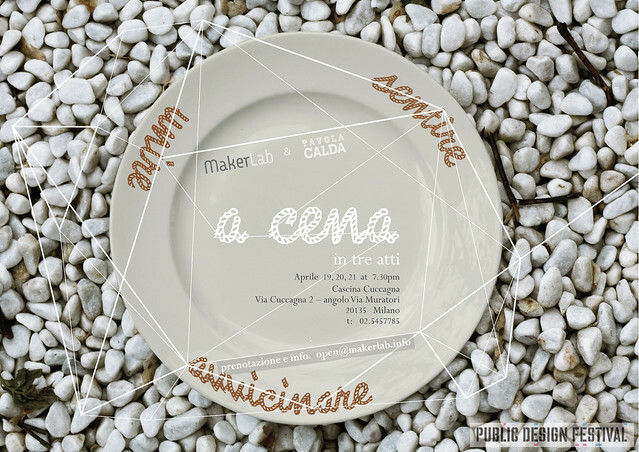 -an open archive where people is invited to share their old and recent pictures of the neighborhood, memories, thoughts, recipes, … : one digital in form of a blog and one analogue in form of a pinboard at Cascina Cuccagna. A cena. In tre atti. Eating is an everyday action. The sameness in the way we live, separate us from the experience of this actions. Since we are not conscious about the act, this separateness obscure our capacity to experience and even make choices. 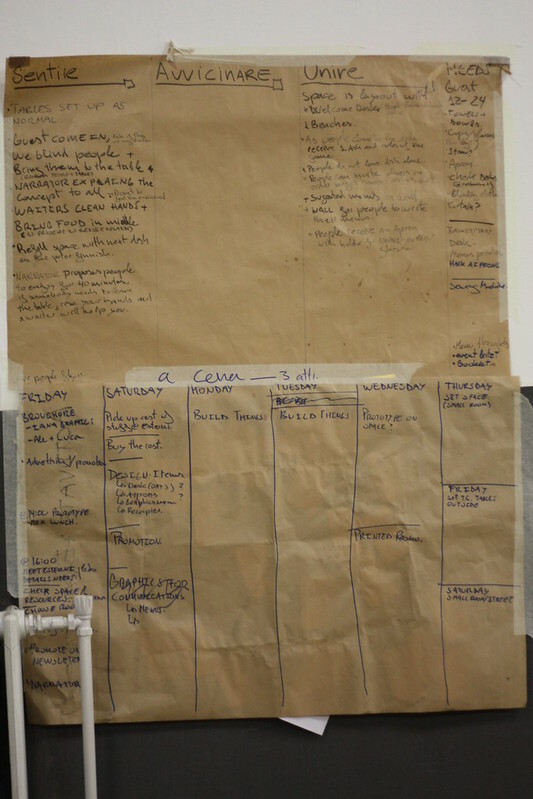 We propose a process to help our 12 guest experience the everyday act of eating, in a magnified way. The same food will be presented in 3 different environments revealing 3 ways of experiencing a meal. 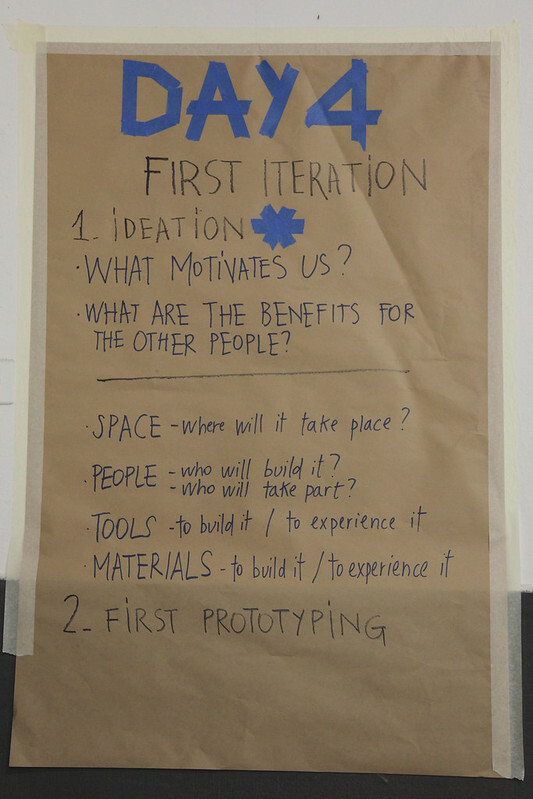 MakerLab is about showing the processes and involving people in the making. 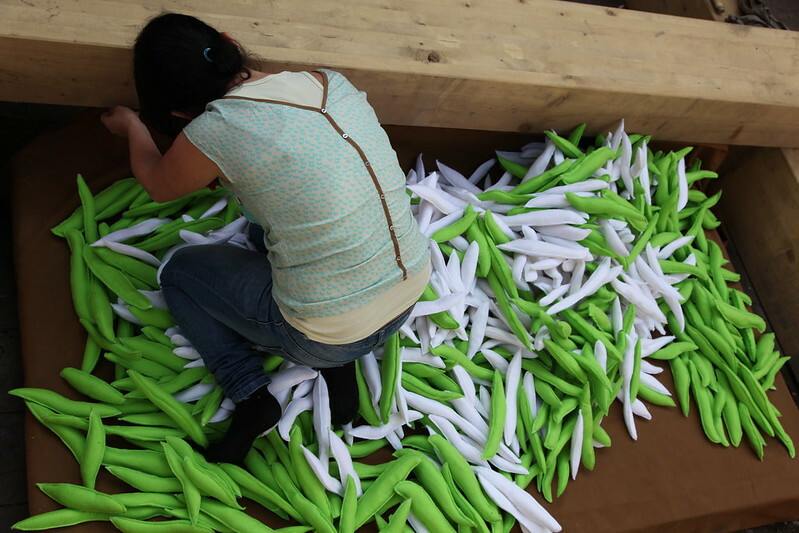 For the Public Design Festival, we want to magnify the everyday act of eating. With this project we are not criticising the behaviour of our everyday life, neither categorizing good or wrong, but understanding through immersion in the process our capacity to know and to make a free choice. In this occasion we decided to choose Food and the way we experience it as our main focus, but we think this represents just one field in which making the process visible can help to wake up our consciousness. We strongly believe this experience could be applied to most of our everyday acts. To keep sharing knowledge with the community, we will be recording every week a discussion about the theme we have been talking about during the week. For this documentary we want to seat everybody around a table, and ask a question to the first interviewee. From what he is saying we find a keyword which will generate the question for the next person. Everybody will listen to what the other says, and thus have the opportunity to build on what the other people is saying without repeating, but adding their perspective. In this way we want to document the key information in a video, and keep the post-production to a minimum. Each group started to started to answer the questions and defining the possible outcome. 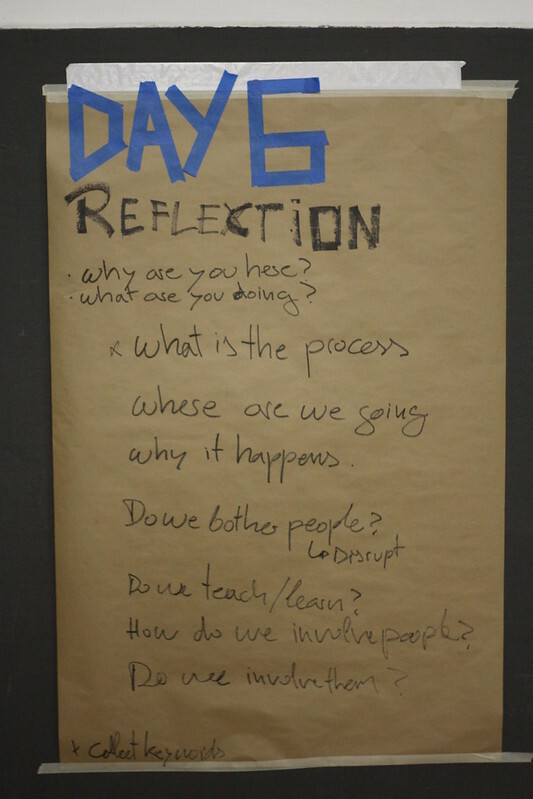 Day 3 was about putting thoughts together to identify what are our common goals. 1. We first arranged the questions that we have (day1) into four categories. 2. 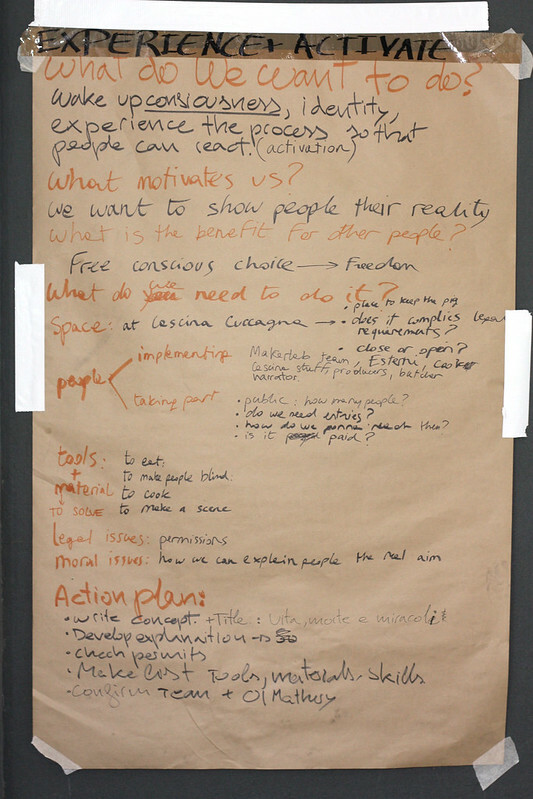 Then we had a quick brainstorm on ideas that we would like to implement. 3. 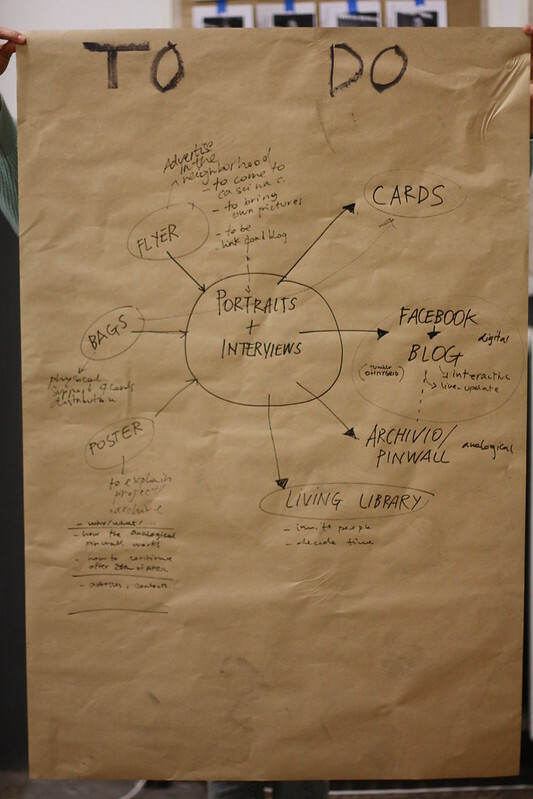 From the questions that we have (day1), our insights (day2) and the first concepts(day 3) we found several keywords that help us to frame the projects. Then we group them to find the themes to work on. Round Table: Involving, Communtyt, Participation, ..
On Tuesday we went around the city looking for interesting spots. Each Maker gathered images that inspired them in certain way. Either as a spot to do something, or as an image that represents certain need of the city or opportunity . Later on we gathered all images on a table and each one of us choose those that somehow sparked a keyword. We then group them into 4 groups that represented those topics we are most interested about because they are latent in the city. 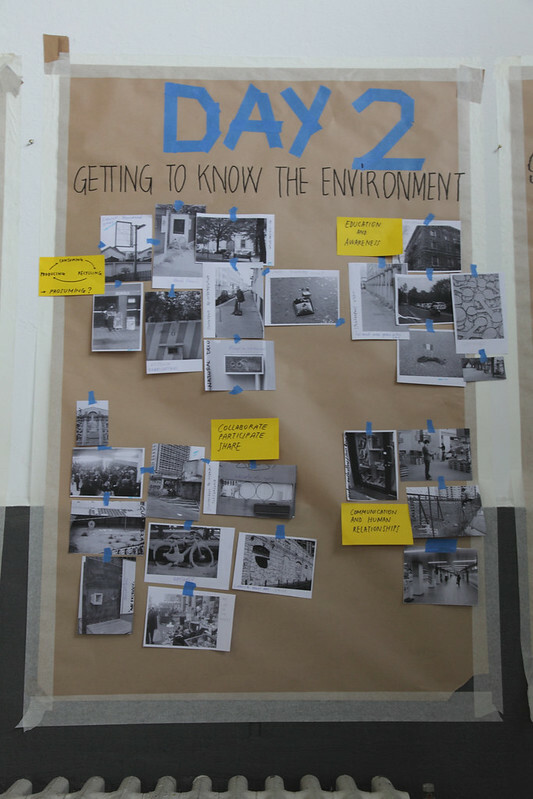 Day 2: Getting to know the environment. Today we are going around the city and collect insights (Through notes, video, photos) to share with the rest. Everybody is welcome to send us their inspiration.